We’re so excited that popular local board game cafe The Gamers’ Lodge will be presenting a Cat Board Game Lounge at the upcoming June 1, 2019 Edmonton International Cat Festival! The Gamers’ Lodge is a community focused board game café and retail store located at 10459 124 Street in Edmonton, Alberta, offering a warm atmosphere, great coffee, delicious food, and awesomely nerdy games and collectibles. We are so grateful The Gamers’ Lodge is a CATivities Sponsor for the festival, which donates 100% of proceeds raised to cat rescues. Below, we’ve rounded up 12 Cat-Themed Board Games you’ve got to try at the upcoming Edmonton International Cat Festival. Or, pop into The Gamers’ Lodge before then and ask them about their cat board game collection! (While you’re there, have a waffle, a sandwich, and some drinks! 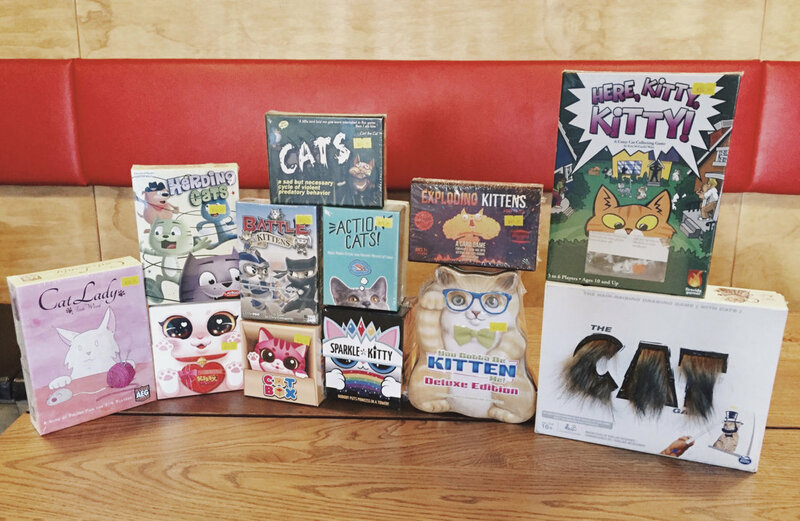 The Purrfect Game For Cat Lovers and Gamers Alike! Players are cat ladies, part of an elite group of people including Marie Antoinette and Ernest Hemingway. During the game, you and your fellow cat ladies will draft cards three at a time, collecting toys, food, catnip, costumes, and of course lovable cats. But watch out! Make sure you have enough food for all of your feline friends or your hungry cats will subtract points from your score. The player with the highest total victory points wins the game! What happens when seven cats run into cardboard boxes? Well, a crazy game of kitty hide-and-seek! Kitty Paw is a dexterity and reaction game. Players try to be the first to complete the kitty combinations shown on the Kitty cards to score victory points (VP). The player with the most VP in the end wins. Each player gets one Kitty card in each round and tries to be the first to create the patterns shown on the cards. Since this is a recognize-and-react game, all players act simultaneously. Who let the cats out? In Herding Cats, these frisky felines have a mind of their own, and only the Cowdog can wrangle them back up again. Cats are lassoed by a Cowdog of a matching color, and you want to be the player to capture a herd of three cats. Beware of the “Stampede!” card that will send the cats running to score points for other players, and look out for the Wild Cat Lady, who may be able to help you out, if you’re in a pinch. Draft your purr-fact team of cute but cutthroat kitties, then deploy them to battlegrounds and watch the fur fly! compete to win the biggest haul of fresh fish and become the pick of the litter! Cat Box is played with cards divided into quadrants each showing an empty box or one of five cats (in a box). Players take turns playing these cards to a shared display, overlapping previous cards by one or two quadrants. Each player is assigned a secret identity; if you are a cat you want as many of your cats showing at the end of the game as possible, and as large a group of them as possible, but if you are the Chihuahua you want empty boxes and groups of exactly three cats. Players can play cards held by themselves or any of their opponents, but one side of the card is used when playing your own cards and the other (mirror image) side when playing other peoples’. The advanced game adds five single-use tokens for each player which have different effects. CATS is a secret selection, simultaneous reveal card game where you play cats in the back yard attempting to catch, steal and eat birds. As the end of the game approaches the paranoia increases. You will laugh, plot and scratch your brain! 1/2 hour. 3 to 5 players. Ages 8 and up. Action Cats is a storytelling game about the secret lives of cats. Players take turns being the judge who draws a cat card and names the cat. Players combine two cards from their hand to form a hilarious, heroic, or sometimes heartbreaking story of the cat. A purrfect game to get the party going or family fun night! Nobody puts princess in a tower! Sparkle*Kitty is an adorably fun, social, and magical spell card game for all ages, sizes and genders. Once upon a time, a group of powerful princesses were captured and locked away in Cursed “No Cursing” towers by the evil queen Sparkle*Kitty! All their words and magic spells vanished and became sugar & spice… almost everything nice. Luckily these are no ordinary princesses and you are no ordinary player! Take matters into your own hands and harness the simple and sweet words into special spell combinations to set yourself free! The first to escape, wins! Exploding Kittens is a highly-strategic, kitty-powered version of Russian Roulette. “It’s like UNO, except there are goats, magical enchiladas and kittens that can kill you.” – CNN. You Gotta Be Kitten Me! is a fast and fun party game featuring adorable animals with accessories! Try and guess what cards are in play as you either raise the bid or challenge another player. Be careful, if you’re wrong, you lose a card! The last player with cards remaining wins. Bluff your way to victory in this cute, but cutthroat game! The meow-ment is here: introducing The Cat Game – a hiss-terical drawing game for cat people (and regular people)! Play solo or divide into two teams and catfight your way to victory. For individual play, select a card from CATegories like fLICKS (movies), PURRsons & PURRfessions (famous people, characters or job titles) or CAT-tivities (actions). Use the erasable drawing board to sketch out each clue – with one cat-veat: you must use a cut-out of a furry feline in each drawing! The first player to guess five clues wins! For large groups, the stakes are raised! Two teams simultaneously battle it out, sketching cat-centric clues in a race to collect 20 points. Only now, players can claw back extra points by guessing the opposing teams clues as well! The fur may fly but fun will definitely be had once you get your paws on The Cat Game! Do you have a favourite cat board game that isn’t listed here? Let us or The Gamers’ Lodge and we’ll try to stock it for the Cat Board Game Lounge at the Edmonton International Cat Festival taking place on Caturday, June 1, 2019. Be sure to stop by The Cat Board Game Lounge presented by The Gamers’ Lodge on June 1! 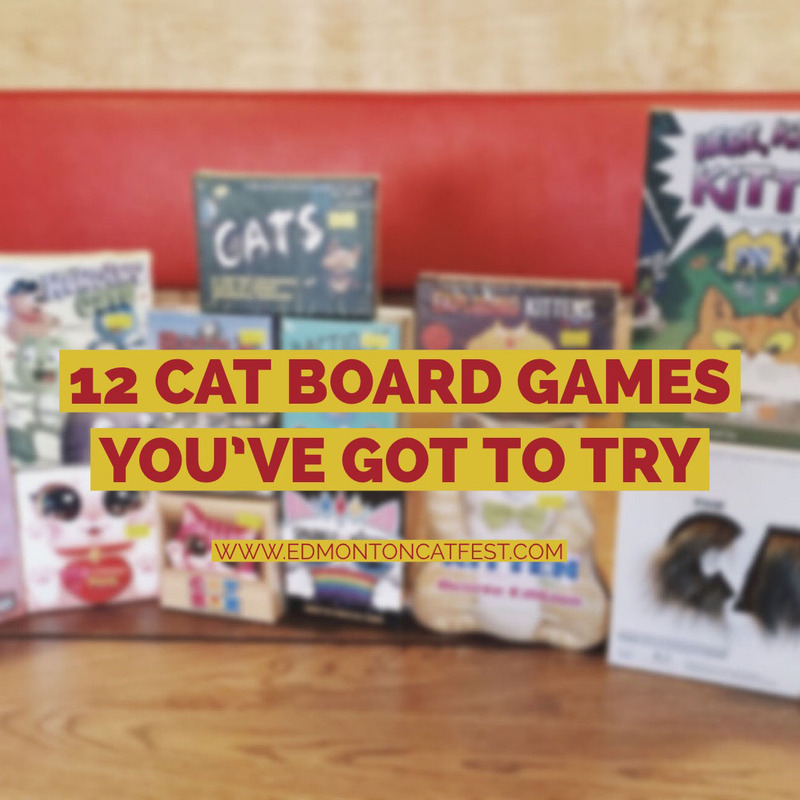 Pin + share this post: 12 Cat Board Games You've Got to Try!